I found this delicious noodle dish off of the Tasty Kitchen website. 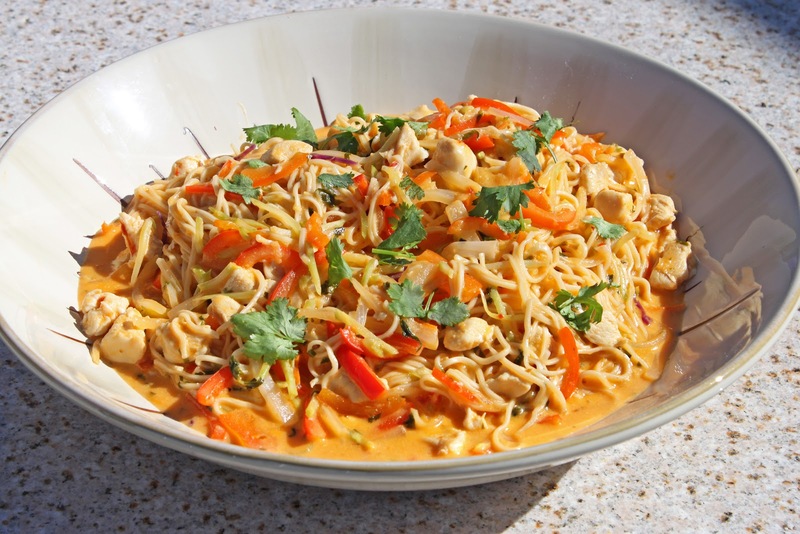 If you enjoy Thai food and curry, this dish tastes exactly like an entree right out of a Thai restaurant. YUM! *I halved the recipe for a serving of 4 and it was plenty for our little family. Start with a large pot over medium-high heat. Scoop the cream off the top of the coconut milk, and put into the pot. The cream will be used as the “fat” instead of oil or butter. Along with the cream, add the curry paste and ginger. Let this simmer for 1 minute. Then add the chicken. Cook the chicken through. Then add the rest of what is in the coconut milk cans, sweet Thai chili sauce, cilantro, and chicken broth. Bring this to a simmer. Then add your julienned veggies and rice noodles. Simmer this. You will see the broth slowly thicken as the rice noodles absorb it. It should only take about 5 minutes for the rice noodles to be cooked through. Pull the pot off the heat, and let sit for about 5 minutes. It will thicken during this time. Then, it’s done. Slurp these noodles out of big noodle bowls! Garnish it with a bit more cilantro. * I have also added peanut butter to this recipe, and a bit of honey if you want a less savory/spicy version. 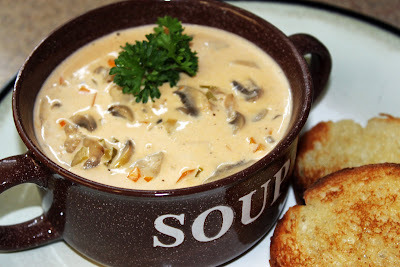 I found this yummy mushroom soup recipe from The Pioneer Woman and since I love mushrooms I had to try it. It is so rich and full of flavor and dipping freshly toasted french bread is a must! I can't wait to try this again on a cold winter day! Mince the carrot and celery nice and fine. Too big and the soup will end up chunky. Toss into the pot and allow them to soften while you slice the mushrooms. Next, add your garlic, right as the carrots and celery start to cook down. Lower the heat and let the soup simmer for about 10 minutes or so, until thickened. Salt and pepper the soup to your own taste. Combine ingredients in a food processor and pulse until desired consistency. Refrigerate at least 1 hour to let the ingredients fuse together; that is if you can wait that long :). 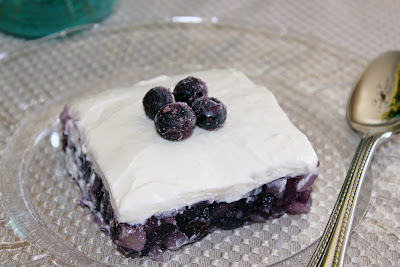 My friend Donelle shared this yummy jello salad recipe with me. I like the versatility with the ingredients, you can change it up to your liking. I've tried cherry pie filling with cherry jello and raspberry pie filling with raspberry jello. It always comes out great! Pour grape jello powder into 9x13 baking dish. Add 2 cups hot water onto jello and dissolve. Add pineapple w/ juice and pie filling. Refrigerate until set. Bring cream cheese to room temperature. Beat cream cheese, add sour cream, vanilla and sugar, combine until smooth. Layer on top of jello. Refrigerate again at least 1/2 hr.